Women's Voices of Glynn County members Paula Galland, standing from left, Anne Rule, and Georgie Mallett help College of Coastal Georgia student Kelsey Farley register to vote during a voter registration drive on campus Tuesday as part of National Voter Registration Day. Photo by Bobby Haven/The Brunswick News. Even during some of the busiest times on College of Coastal Georgia's campus Tuesday, Paula Galland would let few students slip by without asking about their voter registration status. Galland, a member of Women's Voices of Glynn County, and other volunteers stopped students as they walked past the group's tent and encouraged those who were not registered to vote in Glynn County to fill out the forms the volunteers had on hand. "We're grabbing every student that walks by and asking, 'Are you registered to vote?'" Galland said. "And if they say yes, we say, 'In Glynn County?'" Another group of volunteers had a tent set up across campus, to maximize their opportunity to talk with as many students as possible. 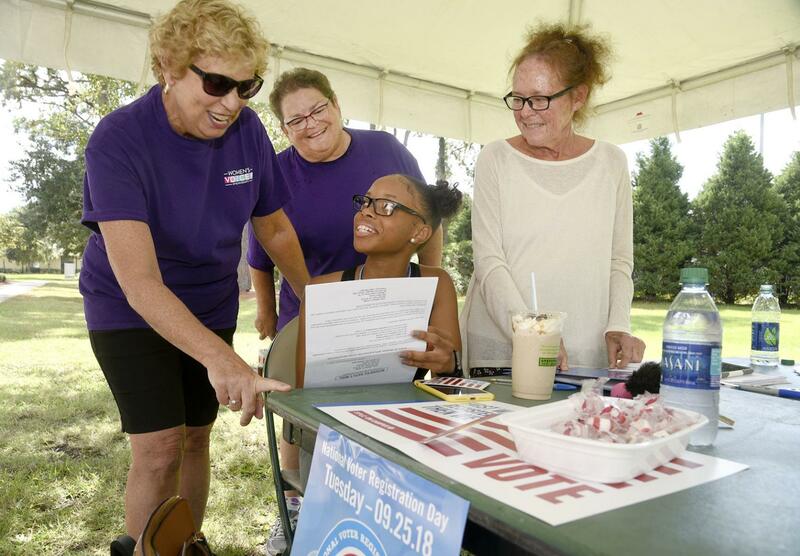 The day-long effort was part of National Voter Registration Day on Tuesday. The nationwide campaign is held annually on the fourth Tuesday of September and aims to create awareness of voter registration opportunities and to push the importance of voting. In Glynn County, several local groups canvassed the community in hopes of increasing the local number of registered voters. "We have sites all over Brunswick — here at the college, at Wrap Happy, at the two high schools and at Job Corps," said Cathy Simprini, a member of Women's Voices of Glynn County, a local nonpartisan group. Early voting begins in Glynn County on Oct. 15 and ends Nov. 2. Election Day will be Nov. 6. On Coastal Georgia's campus, eight Women's Voices of Glynn County volunteers worked with members of the college's Student Government Association to encourage students to register to vote. Many students on campus who did not grow up in Glynn County said they weren't registered to vote locally, Galland said. "Young people are the future of our country, and if you don't vote, you will not have the future you want," she said. "So your vote now matters for what happens when you're my age." The registration forms took only minutes for students to fill out. Kelsie Farley, a Coastal Georgia student from Milledgeville, took the time Tuesday morning to complete the paperwork. "It's been something I've been meaning to do, but just haven't had the time to do it," she said. Increased voter registration and voter participation is among the many focuses of Women's Voices of Glynn County, which was founded in early 2017. "We feel like the 2018 elections are critical for the direction of our country," Simprini said. "We're not supposed to be political, and we're not saying anything political to the students, but we feel really strongly that women's voices need to be heard." Early voting will be open Mondays through Fridays from 8 a.m to 5 p.m. at two locations — the Glynn County Board of Elections office in Brunswick, located at 1815 Gloucester St., and Fire Station #2 on St. Simons, located at 1929 Demere Road. Both locations will be open Saturday, Oct. 27, from 9 a.m. to 4 p.m. The voter registration deadline is Oct. 9 for the Nov. 6 election. Those with questions about voter registration can call the board of elections at 912-554-7060. Republished with the permission of The Brunswick News. Originally published in The Brunswick News.